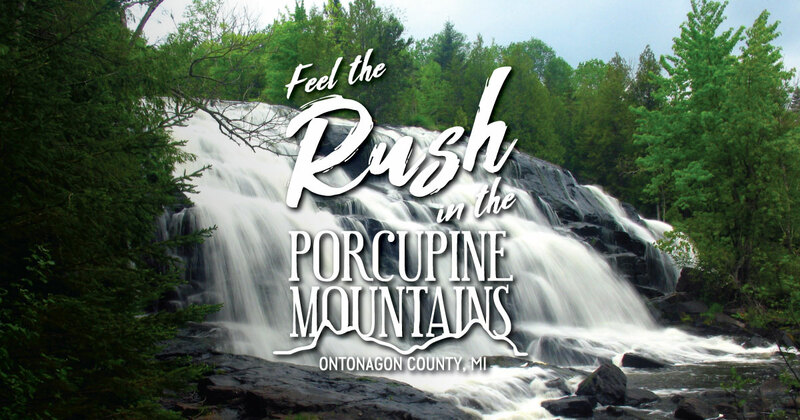 The dramatic natural beauty of the Porcupine Mountains and Ontonagon County is a photographer’s dream. The area is rich in iconic sights, dramatic vistas and wild waterfalls. The region draws professional wildlife photographers as well as people who simply want to capture something beautiful on their phone to share with friends and family. Here are a few of our favorite photo locations. This iconic spot is a must-visit when you’re in the Porkies. It’s one of the most-photographed sights in the entire Upper Peninsula. Flanked by the ancient Porcupine Mountains, Lake of the Clouds stretches out beneath towering trees, beckoning photographers with its beauty. They call it Lake Superior for a reason—the lake stretches out, wide and vast from the foot of the Porkies. Beachcombers stroll the beach in search of agates, but the real gem is the clear blue backdrop of the largest of the Great Lakes. In the summer you may want to wade into the lakes’ cool, clear waters for a selfie—just hold on to your phone. Copper Peak is a flying ski jump—the only flying ski hill outside of Europe. What does that mean? It’s big—really big. While the jump hasn’t held ski jump events in years, there’s a new effort underway to bring competition to the hill. In the meantime, it’s open to the public via an adventure ride that will take you to the top of the jump tower. Located 10 miles north of Bessemer, Copper Peak offers the highest unobstructed vista in the Midwest. You’ll gaze over 2,500 square miles of lush forests and the shimmering waters of Lake Superior. This is one of the region’s most-photographed waterfalls, and when you arrive at the falls, you’ll know why. The falls form a series of dramatic cascades, creating a scene unlike no other. It’s a dream world and the perfect place to pull out a phone or camera. Built in 1866, this lighthouse helped ships navigate Lake Superior for more than a century. It still stands proudly on the shore and is open for tours—visitors are taken up to the lantern room for a great view of the lake, Ontonagon Harbor, and the unique profile of the Porcupine Mountains, some 20 miles away.